Older animals make the best companions for seniors. In some cases, the pets are the only companions aging adults have. 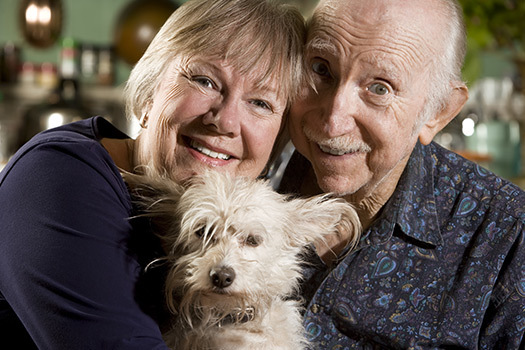 Being a pet owner could enhance your elderly loved one’s health. Here are some of the benefits seniors can gain when they adopt and spend time with senior pets. Older pets are not as energetic and boisterous as younger pets. Therefore, your loved one can care for the pet without using too much time and energy. Your loved one can take the pet on short walks through the neighborhood and do activities that do not put his or her health at risk. By not exerting too much energy, your loved one reduces the risk of slips, falls, and serious injuries. Seniors who need help caring for pets and looking after their own health can benefit from professional in-home care. Pawleys Island, SC, home care professionals can be a wonderful boon to seniors. Whether they require around-the-clock supervision or just need assistance with exercise and household tasks a few days a week, seniors can enjoy a higher quality of life with the help of trusted in-home caregivers. Most senior pets already understand basic commands such as sitting and standing, and they may also be house trained. Your loved one will simply need to reinforce those rules and commands, which shouldn’t be difficult to do. For example, a senior pet will know not to chew on clothing or the furniture, but it may not know what areas of the home it can go in. However, since the pet is pre-trained, your loved one may have an easier time teaching it the new boundaries within the home. Senior pets generally thrive on structure. They are familiar with being walked, fed, and nurtured at regular intervals, which could help your loved one stay organized. Having an older pet can keep your loved one on a schedule, helping him or her remember personal daily routines, and it can also lead to higher levels of self-discipline, which is good for your loved one’s overall health. Your loved one can interact with the pet each day, doing things they both enjoy. This type of interaction can reduce the risk of isolation. Your loved one could also meet other seniors with older pets and form a bond with these individuals. This gives the senior pet the opportunity to interact with other animals while helping your loved one maintain social connections that boost his or her mental and emotional wellbeing. Interacting with compassionate respite caregivers can also help seniors relieve stress and enjoy a higher quality of life. For families living in Pawleys Island, South Carolina, respite care can be a wonderful solution when their aging loved ones need companionship and socialization a few hours a week or just need minor assistance with daily household tasks. At Home Care Assistance, we thrive on helping seniors maintain their independence while living in the comfort of home. Taking care of a pet could boost your loved one’s quality of life and allow him or her to remain independent. Your loved one will need to make sure the pet eats, stays physically active, gets groomed, and is well cared for. This type of responsibility can stimulate your loved one’s brain and stave off cognitive decline. Make sure the responsibility isn’t too much for your loved one to manage. Senior pets are typically easier to care for compared to younger pets that require more training and maintenance. Though having an older pet can be wonderful for boosting an aging adult’s emotional health, some seniors may face health challenges preventing them from taking care of a pet. Living with a serious health condition can make it challenging for seniors to age in place. However, they can maintain a higher quality of life with the help of professional live-in care. Pawleys Island seniors can benefit from assistance with meal prep, bathing, transportation to the doctor’s office, medication reminders, and much more. To learn about our high-quality in-home care plans, give Home Care Assistance a call at (843) 353-3105 today.